The following trigger is a database scoped trigger. This will prevent users from creating, altering or dropping tables only from the database in which it is created. If you have another database on the server, they will be able to create, alter or drop tables in that database. If you want to prevent users from doing this you may create the trigger again in this database. But, what if you have 100 different databases on your SQL Server, and you want to prevent users from creating, altering or dropping tables from all these 100 databases. Creating the same trigger for all the 100 different databases is not a good approach for 2 reasons. 2. Maintainability is a night mare. If for some reason you have to change the trigger, you will have to do it in 100 different databases, which again is tedious and error prone. This is where server-scoped DDL triggers come in handy. When you create a server scoped DDL trigger, it will fire in response to the DDL events happening in all of the databases on that server. 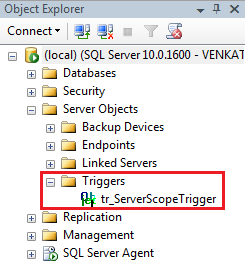 Creating a Server-scoped DDL trigger : Similar to creating a database scoped trigger, except that you will have to change the scope to ALL Server as shown below. Now if you try to create, alter or drop a table in any of the databases on the server, the trigger will be fired.